A guide for finding the best available research evidence quickly and efficiently. 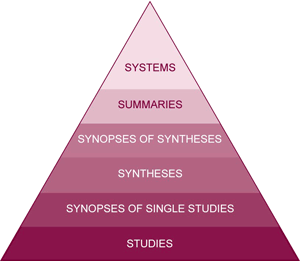 Each level of the pyramid draws on research evidence from the lower layers, therefore more synthesized evidence is found at the higher levels. It is recommended that searching for evidence begin at the top (or the highest possible level) of the pyramid. The difference in the number of events (outcome) between intervention and control groups (obtained by subtracting number of events in the intervention group from the number of events in the control group); usually reported as a %. Also see: Absolute risk reduction. The difference in the number of events (outcome) in the control group minus the number of events (outcome) in the treatment group. For example, if the number of events (e.g. death) in the control group (not receiving the intervention) is 40 per 100 patients, while the number of events in the intervention group is 30 per 100 patients, ARR = 0.40 – 0.30; ARR = 0.10 or 10%. This means the intervention group has a 10% absolute lower risk of death than the control group. Barratt, A., Wyer, P.C., Hatala, R., McGinn, T., Dans, A.L., Keitz, S., Moyer, V., Guyatt, G. (2004). Tips for learners of evidence-based medicine: 1. Relative risk reduction, absolute risk reduction and number needed to treat. CMAJ, 171(4), 353-358. A process by which participants are assigned to either the experimental (intervention) group or comparison/control group in a study. Random allocation is done by chance. Studies that allocate participants that do not use random allocation usually do so by having participants selected themselves or are selected by the researcher to receive the intervention. Cullum, N., Ciliska, D., Haynes, R. B., & Marks, S. (2008). Evidence-Based Nursing: An Introduction. Oxford: Blackwell. To quantify the relationship, the rate of the outcome in the intervention/exposed and control/comparison groups are compared. An experimental study implies active involvement of the researcher, (ie. Researcher involved in allocating participants to groups) while an observational study implies passive involvement of researcher (e.g. participants self-select to receive an intervention). Glasziou, P., & Heneghan, C. (2009) A spotter’s guide to study design. Evidence-Based Nursing, 12(3), 71-72. Applicability assesses the feasibility of providing an intervention in a local setting. Applicability considers cost-effectiveness, organizational culture and capacity. Buffett, C., Ciliska, D., & Thomas, H. (2007). Can I use this evidence in my program decision? Assessing applicability and transferability of evidence. Hamilton, ON: National Collaborating Centre for Methods and Tools (NCCMT). The process of assessing the quality of study methods in order to determine if findings are trustworthy, meaningful and relevant to your situation. A systematic error in the design, conduct, or interpretation of a study that may cause a difference from the truth. For example, selection bias can occur when the results of a study are distorted by the way in which the participants are chosen to take part. Occurs in an experimental study when patients, clinicians providing an intervention, people assessing outcomes, and/or those analyzing data are unaware of the group to which participants were assigned. Bracketing is a method to increase the rigor of the project by mitigating the potential effects of unacknowledged preconceptions related to the research. A close relationship may exist, or may develop during the process of qualitative research, between the researcher and the research topic. Bracketing protects the researcher from the cumulative effects of examining what may be emotionally challenging material. The development of knowledge, skills and attitudes among individuals and groups of people. Also involves the creation of structures, resources, policies and procedures in organizations and networks to sustain and achieve relevant goals, to cope with complexity and to innovate. An observational study that begins by identifying participants who have the outcome of interest, e.g. disease (cases) and participants who are similar to cases who do not have the outcome of interest (controls) and then looking back in time to see whether participants in both groups were exposed to risk factors or causal factors associated with the outcome. For example, identifying patients with (cases) and without (controls) lung cancer and looking back in time to determine past smoking behaviour (exposure to tobacco). A study reporting observations on a single individual. The Cochrane Collaboration. (2010). Glossary. Retrieved from http://community.cochrane.org/glossary. A report on a series of patients with an outcome of interest, or receiving the same intervention, with no comparison group. The study of selected current phenomenon over time to provide an in-depth description of essential dimensions and processes of the phenomenon. Case studies may involve both qualitative and quantitative data and may focus on single or multiple cases. LoBiondo-Wood, G., & Haber, J. (2002). Nursing research: Methods, critical appraisal and utilization (5th ed.). St. Louis: Mosby. Studies that consider risk factors (exposure) for certain diseases/problems/conditions (outcomes), e.g. the effect of patient characteristics (exposure) on the development of pressure ulcers (outcome). Also referred to as “etiology” or “aetiology”. Assesses whether the size of the effect of an intervention is big enough to justify the investment required for its implementation. Assessing clinical significance takes into account factors such as the size of a treatment effect, the importance of the problem being addressed, the other potential outcomes of the intervention, and the cost of implementation. Adapted from The Cochrane Collaboration. (2014). Glossary. Retrieved from http://community.cochrane.org/glossary. Of particular interest, there is a review group for public health (http://ph.cochrane.org/cphg-reviews-and-topics) and for implementation of evidence (The Effective Practice and Organization of Care Review Group, http://epoc.cochrane.org/). A study design in which participants who do not have the outcome of interest are allocated (but not randomly) to receive alternative treatment/therapy/interventions (experimental group) or the standard of care or conventional treatment (comparison group) or no intervention (control group) and then followed up to determine whether they experience the outcome of interest. DiCenso, A., Guyatt, G., & Ciliska, D. (2005). Evidence-based nursing: A guide to clinical practice. St. Louis, MO: Elsevier Mosby. A study in which a group of people with a common set of characteristics or a set of characteristics are followed up for a period of time to determine the incidence of an outcome. A process of interaction where actors work together to achieve desired outcomes. Voluntary, flexible networks of people with a common interest who learn about, share knowledge and develop expertise on an issue. Participants in a study who receive the standard of care or conventional therapy/treatment instead of the experimental therapy/treatment (intervention). Provides the likely range of the true value of interest (e.g. the effect of an intervention or treatment). The CI is usually reported as ‘95% CI’, which means that 95% of the time the true value (effect) for the population lies within the given range of values. A component of qualitative validity, confirmability refers to the degree to which the results could be confirmed or corroborated by others. A factor that is associated with both an intervention (or exposure) and the outcome of interest. For example, if people in the experimental group of a controlled trial are younger than those in the control group, it will be difficult to decide whether a lower risk of death in one group is due to the intervention or the difference in age. Age is then said to be a confounder, or a confounding variable. Confounding is a major concern in non-randomized studies, given there is greater chance that confounders will not be equally distributed among groups. Data with a potentially infinite number of values along a continuum (weight, blood pressure, temperature). Participants in a study who receive no intervention and whose performance provides a baseline against which the effects of the treatment can be measured; when a study does not involve a true experimental design [randomized controlled trial (RCT)] this group may also be called the “comparison group”. Polit, D. F., & Hungler, B. P. (1999). Nursing research: Principles and methods (6th ed.). Philadelphia: Lippincott. A component of qualitative validity, credibility refers to the ability of a study to reveal the truth, and the probability that the study’s methods will produce plausible findings. Russell, C. K., & Gregory, D. M. (2008). Evaluation of Qualitative Research Studies. In N. Cullum, D. Ciliska, R. B. Haynes & S. Marks (Eds. ), Evidence-based nursing. An introduction (pp. 204-218). Oxford: Blackwell. The process of systematically examining research to judge its trustworthiness, and its value and relevance in a particular context. An observational study that examines a characteristic (or set of characteristics) and the outcome of interest in participants at one point in time. Sometimes referred to as a survey study. For more information, see Registry Methodology. Data saturation occurs when research questions are comprehensively and completely answered, when participant interviews are no longer adding new information to the study finding, or when findings begin being repeated. Russell, C. K., & Gregory, D. M. (2008). Evaluation of Qualitative Research Studies. In N. Cullum, D. Ciliska, R. B. Haynes & S. Marks (Eds. ), Evidence-based nursing: An introduction (pp. 204-218). Oxford: Blackwell. A component of qualitative validity, dependability refers to the concept of consistency within a study, and whether the process of research is logical and clearly documented, particularly as it relates to the chosen method and decisions made by the researchers. A study that describes characteristics of a sample of individuals. Unlike an experimental study, the investigators do not actively intervene to test a hypothesis, but rather describe the health status or characteristics of a sample from a defined population. Descriptive studies include case reports, case-series, qualitative studies, and surveys (cross sectional studies). Glasziou, P., & Heneghan, C. (2009). A spotter’s guide to study design. Evidence-Based Nursing, 12(3), 71-72. Data that can take one of two values (eg, dead or alive, symptoms present or absent). Also known as binary data. An online space in which people can share knowledge about a common interest. A qualitative research method whereby the experience of a culture is studied. Data collection approaches include participant observation, in-depth interviews, and field work. Efforts aimed at determining, as systematically and objectively as possible, the relevance, effectiveness and impact of health-related (and other) activities in relation to objectives. Evaluation may or may not involve taking into account the resources that have been used. Public Health Agency of Canada. (2006). Glossary of terms relevant to the core competencies for public health, E-H. Retrieved from http://www.phac-aspc.gc.ca/php-psp/ccph-cesp/glos-eng.php. Rychetnik, L., Hawe, P., Waters, E., Barratt, A., & Frommer, M. (2004). A glossary for evidence based public health. Journal of Epidemiology and Community Health, 58, 538-545. Information or facts from a variety of both qualitative and quantitative sources, that are systematically obtained, i.e. obtained in a way that is replicable, observable, credible, verifiable, or basically supportable. Adapted from Rycroft-Malone, J., & Stetler, C.B. (2004). Commentary on evidence, research, knowledge: a call for conceptual clarity. Worldviews on Evidence-Based Nursing, 1(2), 98-101. The conscientious, explicit and judicious use of the current best evidence in making decisions about the care of individual patients. Sackett, D.L., Rosenberg, W.M., Muir-Gray, J.A., Haynes, R.B., & Richardson, W.S. (1996). Evidence-based medicine: what it is and what it isn’t. BMJ, 328, 535-536. Recognizes that important evidence comes from a variety of sources: community health issues and local context; public health resources; community and political climate; and the best available research findings. Decision makers must draw on their explicit and tacit public health knowledge and expertise to incorporate all the relevant factors into the final decision, conclusion or recommendation. This model is particularly relevant for decision making in the fifth step of evidence-informed public health: Adapt the information to a local context. Evidence-Informed Decision Making was formerly called Evidence-Based Decision Making. National Collaborating Centre for Methods and Tools. (2009). A Model for Evidence-Informed Decision-Making in Public Health. [fact sheet]. Retrieved from http://www.nccmt.ca/pubs/FactSheet_EIDM_EN_WEB.pdf. Put simply, it means finding, using and sharing what works in public health and involves seven steps: define, search, appraise, synthesize, adapt, implement, and evaluate. Participants in a study who receive the experimental therapy/treatment or intervention. A research design, most often a randomized controlled trial, that sorts study participants into two or more groups, with a minimum of one control group, the other(s) being the intervention group(s).Groups are then followed to assess whether or not an intervention (e.g. test, or treatment) that is controlled by the investigator, affects the course or outcome of a condition or disease. Experimental studies (rather than observational studies) are the preferred choice for most medical studies because control groups help minimize bias. Knowledge that is available in spoken or written form; data and information that are arranged according to well-defined, formalized procedures or rules. Contact with something that influences the development of an outcome or improves the outcome for a person (e.g., exposure to something that causes an increased risk for developing a disease or, in people who already have the disease, reaching a particular endpoint). An online grouping of related threads of discussion for people with common interests. Fundamental qualitative description is a purely descriptive research design with less interpretation than might be found in other qualitative descriptive studies such as phenomenological, grounded theory, or ethnographic. A qualitative research approach used to discover the social-psychological processes inherent in a phenomenon. Adverse consequences of exposure to a stimulus. A sampling method used in qualitative research whereby researchers select participants who can provide different narratives or accounts of experiencing a phenomenon. Often times, selection is based on differences in demographics or characteristics. Thompson, C. (2008). If you could just provide me with a sample: Examining sampling in quantitative and qualitative research. In N. Cullum, D. Ciliska, R. B. Haynes & S. Marks (Eds. ), Evidence-based nursing: An introduction (pp. 58-66). Oxford: Blackwell. A sampling method used in qualitative research whereby researchers decide at the beginning of the study to select participants who can provide similar stories or narratives on a phenomenon. Often selection is based on shared demographics or characteristics. The resource must contain a method and/or tool. The method/tool must be used for one of the four types of knowledge translation activities. The resource must be relevant to/adaptable for use in public health contexts. The Inclusion Screening tool guides this process. Involves engaging and integrating those who will need to act on the findings, the knowledge users, into the research process. All patients are analyzed in the groups to which they were randomized, even if they failed to receive/complete the intervention. Intention-to-treat analysis helps prevent bias caused by the loss of participants, and the resulting imbalance between comparison groups. Also known as Qualitative Description, this is a qualitative research design that describes a phenomenon. Interpretive description is the foundation of all qualitative research designs. The aspect of interest in experimental and observational studies. Interventions can be therapeutic (e.g. different wound dressings), preventative (e.g. influenza vaccination), and diagnostic (e.g. measurement of blood pressure), targeted at individuals, groups, organizations, communities or health systems. Within the context of qualitative research, key informant refers to the person who is interviewed about a particular organization, social program, or problem. The key informant serves as a proxy for her or his associates within an organization or group. Key informant interviews are in-depth interviews of a select (non-random) group of experts who are most knowledgeable of the organization or issue. Parsons, J. (2008). Key Informant. In P. Lavrakas (Ed. ), Encyclopedia of Survey Research Methods. (p. 407). Thousand Oaks, CA: Sage Publications. The capacity for effective action that results from information, including familiarity, awareness and understanding gained through experience or study. It results from making comparisons, identifying consequences and making connections. Results in putting knowledge into action in practice settings or circumstances, including adoption, uptake, use and mobilization. It is also important to figure out how to use evidence appropriately and effectively within the local context. For example, developing a protocol to support a new program is an application activity. c) individual and organizational capacity to participate effectively in the evidence-informed decision making process. The process of pushing out or distributing information, including research evidence, and adapting the content and the means for delivery to appropriate for the intended audience(s). Activities and tools include briefing documents, educational sessions or workshops, online reviews, summary statements and publications. Collaborative problem-solving between researchers and decision makers that happens through linkage and exchange. Effective knowledge exchange involves interaction between decision makers and researchers and results in mutual learning through the process of planning, producing, disseminating, and applying existing or new research in decision making. Canadian Health Services Research Foundation. (2012). Glossary of Knowledge Exchange Terms Used by the Foundation. Retrieved from http://www.cfhi-fcass.ca/PublicationsAndResources/ResourcesAndTools/GlossaryKnowledgeExchange.aspx. The systematic application of policies, methods and tools to create, capture, share and leverage the knowledge needed for an organization to succeed. Clemmons Rumizen, M. (2002). The complete idiot's guide to knowledge management. Indianapolis, IN: Alpha Books. A process of assessing current research evidence and expert opinion and providing a more comprehensive perspective on a specific topic. Syntheses identify gaps in evidence to help establish future research priorities and provide information to support policy and program decision making. The components are: identifying a question/problem of interest; establishing criteria to inform study selection; searching literature for relevant research; appraising studies critically; combining study results statistically/thematically; and summarizing synthesis findings. A systematic process for sharing knowledge between researchers and research users, including the synthesis, dissemination, exchange and ethically sound application of knowledge. The goal is to improve the health of Canadians, provide more effective health services and products and strengthen the health care system. A study that examine changes in the same participants over time. A method for combining the results of several independent studies that measure the same outcomes resulting in one overall summary statistic. Dawson-Saunders, B., Trapp, R.G. (1994). Basic and Clinical Biostatistics. Norwalk: Appleton & Lange. NCCMT uses this term to describe standardized processes, approaches or steps that facilitate access to and use of information for knowledge translation and decision making (e.g., a framework to create a dissemination plan). Research that combines data collection approaches, sometimes both qualitative and quantitative, into the study methodology, and is commonly used in the study of service delivery and organization. Some mixed method studies combine study designs, whereas others may have a single overarching research design, but use mixed methods for data collection. Occurrence of an illness or illnesses in a population. Occurrence of death in a population. A system of interconnected individuals, groups or organizations as well as the links between them. Is the number of patients who must be treated to prevent 1 additional negative event (or to promote 1 additional positive event). This is calculated as 1/absolute risk reduction (rounded to the next whole number), accompanied by the 95% confidence interval. When assessing clinical significance, one must consider the NNT against any harms or adverse effects. A research design that requires investigators do not intervene or control variables rather, they observe the course of events. Changes or differences in one characteristic (e.g. whether or not people received the intervention of interest) are studied in relation to changes or differences in other characteristic(s) (e.g. death), without action by the investigator. There is a greater risk of bias in observational studies than in experimental studies. (Also known as non-experimental study). Describes the odds of a patient in the experimental group having an event divided by the odds of a patient in the control group having the event; or the odds that a patient was exposed to a given risk factor divided by the odds that a control patient was exposed to the risk factor. A typical pattern of activities and connections through which members experience being a network, such as meetings, open-ended conversations, projects, content, access to expertise, relationships, individual participation, community cultivation and serving a context. The target variable of interest that is hypothesized to depend on or be caused by another variable (the independent variable). A statistical value, which relates to the probability that the obtained results are due to chance alone; a p value of < 0.05 means that there is less than a 1 in 20 probability that the result occurred by chance alone. An individual who participates and provides information in a study; also called a “subject” of a study. 1) Involves participation by the people involved in the research at all stages of the research process. 2) Values ways of knowing as theory is generated from the experiences, lives and understandings of all participants. 3) Focuses on empowerment and power relations in participatory research. People’s awareness of their own capabilities and capacity is strengthened by their participation in the research process. 4) Views consciousness-raising as the core of this approach. The research process may be educational for both the researcher and the participants because together they generate data. 5) Aims to create social change, which addresses the inequality of power distribution, and to affect the lives of those who participate in the research (including the researcher) in ways that the participants see as being beneficial to their lives. Koch, T & Kralik, D. (2006). Participatory Action Research in Health Care. Australia: Blackwell. A qualitative study design that represents an approach to enquiry that emphasizes the complexity of human experience and the need to understand that experience holistically, as it is actually lived. Polit, D.F., & Hungler, B.P. (1997). Essentials of Nursing Research: Methods, Appraisal and Utilization. Philadelphia: Lippincott. The initial stage of knowledge translation, before the doing and evaluation stages. Planning methods and tools are used when thinking about how to frame, approach or organize knowledge translation activities. For example, a planning tool with a work plan and checklist for actions can be used to help prepare a dissemination strategy. An observable collection of people (or organizations) that share important characteristics; the total number of subjects from which to derive a study sample. Kirch, W. (Ed). (2001). Population. In Encyclopedia of Public Health. (pp. 1116-1117). New York: Springer. Research evidence that has been reviewed for methodological rigour, synthesized, and in some cases further summarized into key messages by an individual or group, for example synopses of systematic reviews (syntheses) or synopses of studies. Robeson, P., Dobbins, M., DeCorby, K., & Tirillis, D. (2010). Facilitating access to pre-processed research evidence in public health. BMC Public Health, 10, 95. Evidence that someone has synthesized and in some cases critically appraised and further summarized into key messages. Participant characteristics that give increased or decreased risk of a positive or adverse health outcome from a given disease. An organized activity or way of thinking designed to promote, protect, improve and/or restore the health of individuals, specific groups or the entire population. A combination of sciences, skills and values aimed at protecting and improving the health of all people. The term “public health” can describe a concept, a social institution, a set of scientific and professional disciplines and technologies and a form of practice. It is a way of thinking, a set of disciplines, an institution of society and a manner of practice. It has an increasing number and variety of specialized domains and it demands of its practitioners an increasing array of skills and expertise. People who work in the public health field, ranging from frontline public health providers (e.g., public health nurses, environmental health inspectors, dental hygienists, health promoters, etc.) to administrators (e.g., medical officers of health, program managers) and policy makers in provincial and federal government. A sampling method used in qualitative research, whereby researchers consciously select a small number of participants that meet particular inclusion criteria covering a range of relevant perspectives. Research that aims to generate an understanding of complex, unquantifiable phenomena, such as people’s experiences or perceptions. A few examples of types of qualitative research include phenomenology, grounded theory, participatory action research, and ethnography. Quality assessment criteria are checklists or standards that are used to evaluate research evidence. These criteria can be applied to assess the value of a single study, or to assess several studies as part of the systematic review process. Quality assessment criteria address different variables, depending on the nature and purpose of the research, and the expectations and priorities of the reviewers. Criteria include: methodological rigour, levels of evidence, strength of evidence, magnitude, completeness, relevance, and criteria of causation. The investigation of phenomena that lend themselves to test well-specified hypotheses through precise measurement and quantification of pre-determined variables that yield numbers sustainable for statistical analysis. DiCenso, A., & Guyatt, G. (2005). Health care interventions. In DiCenso, A., Guyatt, G., & Ciliska, D. (2005). Evidence-based nursing: A guide to clinical practice. St. Louis, MO: Elsevier Mosby. Assignment of participants to groups (experimental or comparison/control) by chance. This ensures that all of the participants have an equal chance of being assigned to either group (experimental or comparison/control group) and ensures all groups are balanced with respect to known or unknown factors that may affect the outcome of interest. A method of selecting participants for a study that uses some type of random selection to ensure that different units of the population being sampled are equally likely to be selected. Also know as probability sampling. An experiment in which participants or populations who do not have the outcome of interest, are allocated by chance to receive an intervention (intervention group) or not (comparison or control group) and then followed up over time to determine if differences between groups occurs on the outcome of interest. Waters, E., Doyle, J., Jackson, N., Howes, F., Brunton, G., & Oakley, A. (2006). Evaluating the effectiveness of public health interventions: The role and activities of the Cochrane Collaboration. Journal of Epidemiology and Community Health, 60, 285-289. The proportional increase in the rates of good outcomes between experimental and control participants; it is reported as a percentage (%). RB is calculated by dividing the rate of the positive outcome in the experimental group minus the rate of the positive outcome in the control group by the rate of the positive outcome in the control group. The proportion of patients experiencing an outcome in the treated (or exposed) group divided by the proportion experiencing the outcome in the control (or unexposed) group. It tells us the risk or probability of an event occurring in the intervention group compared to the control group. For example, if the number of events (e.g. death) in the control group (e.g. receiving placebo) is 60 per 100 control group members, while the number of events in the treatment/intervention group is 15 per 100 intervention group members, RR = (15/100) / (60/100), RR = 0.25 or 25%. Treatment reduced the probability(risk) of an event to 25% of what it would have been without treatment. An alternative interpretation is the Relative Risk Reduction. The applicability and appropriateness of information as it relates to a question or issue at hand. Patient characteristics associated with the development of a disease in the first place. Authors often distinguish between risk factors and prognostic factors. Prognostic factors are patient characteristics that give increased or decreased risk of a positive or adverse health outcome from a given disease. A selected subset of the population. A sample may be random or non-random, and may be representative or non-representative. Last, J. (2001). A Dictionary of Epidemiology (4th ed.). New York, NY: Oxford University Press. A strategy to gather relevant knowledge translation methods and tools. These resources are then screened to determine if they will be included in the Registry (see Inclusion Screening). A sequence of events or a combination of circumstances (which impacts a given population). A sampling method used in qualitative research when no sampling frame exists or when access to individuals might be difficult because of cultural or social reasons. Usually an initial respondent is asked if they know of any other potential participants who might be willing to speak with the researchers. Sometimes participants are asked if they would be willing to approach potential informants on behalf of the researchers. Indicates the extent to which results obtained in a study occurred by chance and the null hypothesis is rejected (meaning that there is a difference in outcome between the groups). When statistically significant, the probability of finding the result by chance falls below a specified level of probability (most often p<0.05). A succinct description of a study or systematic review. Summaries briefly present to decision makers the full range of available evidence on a given health issue. Haynes, B. (2007). Of studies, syntheses, synopses, summaries, and systems: The “5S’ evolution of information services for evidence-based healthcare decisions. Evidence-Based Nursing, 10, 6-7. NCCMT creates summary statements for all the resources in the Registry of Methods and Tools. Each Registry summary includes a plain-language description of the resource including information about its relevance to public health, how it was developed, how it can be used and whether (and how) it has been evaluated. The final step in producing a summary statement of a knowledge translation resource for the Registry. Information from the data extraction tool, the Measurement and Descriptive Information (MADI) Tool, is transferred to the Summary Writing Template to complete the writing process. An observational study that examines a characteristic (or set of characteristics) and the outcome of interest in participants at one point in time. Sometimes referred to as a cross sectional study. Provides a brief, but often sufficiently detailed summary of a high-quality study that can inform clinical practice. Summarizes the findings of a high-quality systematic review and is often accompanied by a commentary that addresses the methodological quality of the review and the clinical applicability of its findings. Brief descriptions of original articles and reviews such as those that appear in the evidence-based journals. Haynes, R.B. (2007). Of studies, syntheses, synopses, summaries and systems: the “5S” evolution of information services for evidence-based healthcare decisions. Evidence-Based Nursing, 10, 6-7. A summary of all evidence that relates to a particular question; the question could be one of intervention effectiveness, causation, diagnosis or prognosis. There are many ways in which syntheses can be conducted (e.g. systematic reviews, meta-analyses, narrative, critical realist, interpretative). It is important to assess the rigor of syntheses using criteria relevant for the process used in doing the synthesis. A review of a clearly formulated question that uses systematic and explicit methods to identify, select, and critically appraise relevant research, and to collect and analyze data from the studies that are included in the review. Statistical methods (meta-analysis) may or may not be used to analyze and summarize the results of the included studies. A systematic review differs from a traditional literature review in that a literature review describes and appraises previous work, but does not specify the methods by which the included studies were identified, selected, or evaluated. Evidence-based clinical information systems that integrate and concisely summarize all relevant and important research evidence about a clinical problem and automatically link, through electronic medical records, a specific patient’s circumstances to the relevant information. Knowledge that resides within people in an organization and is not formalized into written or documented forms; accessible only through conscious efforts. A method of sampling practiced in theory research. Theoretical sampling refers to decisions made throughout the entire research process in which data sources are selected based on emerging study findings. The ultimate goal is to develop a theory that is grounded in the data and accounts for behavioral variation. NCCMT uses this term to describe standardized products such as instruments, surveys and checklists that facilitate access to and use of information for knowledge translation and decision making (e.g., a checklist for a dissemination plan). A component of qualitative validity, transferability refers to the degree to which the results of qualitative research can be generalized or transferred to other contexts or settings. A component of qualitative analysis, whereby key findings are corroborated using multiple sources of information. Powers, B. A. (2005). Generating evidence through qualitative research. Evidence-based practice in nursing & healthcare: A guide to best practice (pp. 283-298). Philadelphia, PA: Lippincott. The degree to which a result (of a measurement or study) is likely to be true and free of bias (systematic errors). An attribute of a person or object that varies, that is, takes on different values (e.g. body temperature, age, heart rate).